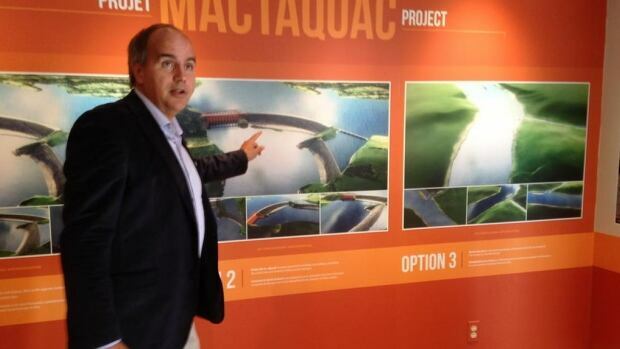 NB Power CEO Gaetan Thomas gestures towards the visualizations for the three Mactaquac options, including the ‘removal’ option, which seems to remove not only the dam and its headpond, but all other infrastructure and trees as well. Monday NB Power announced its public engagement process related to the Mactaquac Dam decision (rebuild, decommission, or remove). Five public meetings are planned in the region for a nine-day period in October, all mid-week or I’d be heading up, and they also have an online survey for people to share their opinions and values. They have also released a few draft reports for comment, including the frugally scoped and costed Social Impact Comparative Review undertaken by Dillon who is also doing the First Nations engagement (no reports yet available on that). This is all a very tightly constrained process and I will watch with interest how it proceeds and how (if) the resulting data is synthesized and used.